Born 14th December 1974, Alun became interested in playing bass after seeing Gene Simmons with Kiss on TV in the late 80s ( that's right - it wasn't even the make up era, it was the dodgy wig Crazy Nights era!). Unable to afford a bass, he set about dropping hints for the following Christmas ( this started in the Spring!) and set about learning everything he could about the bass and music . For reasons best known to himself, he strung a 15" ruler with four elastic bands and used that for nearly a year. Alun later said that "Using the Ashbory (which has silicone rubber strings) feels like I've come full circle." 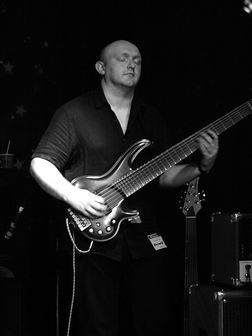 Through Steve Simmons,he joined Fat Barry's Soul Band, a Welsh Commitments/Blues Brothers style act that he played with for several years,leaving in 1999. Steve was also playing with rock group Karnataka, which ultimately led to friendships that led to Alun being asked to join Panic Room when Karnataka dissolved.He recorded two albums with Panic Room, including the award winning "Satellite" which included writing credits on "Black Noise" and "The Great Divide". Through Nothing Personal, Alun also met jazz pianist Dave Cottle who runs the hugely successful Swansea Jazzland club. This collaboration has led to Alun playing with some of the finest players on the UK jazz scene as well as backing visiting musicians from Europe and the US. Alun is a busy recording artist, producing a string of solo releases in addition to playing on albums by artists in the UK and,thanks to the internet, Europe and the US. Alun is also a tutor on trumpeter Steve Waterman's annual big band jazz course, performs solo bass shows and runs an instructional website, Bassbook. A full list of Alun's credits can be found HERE. Alun is proud to endorse the Hartke VXL Bass Attack preamp.